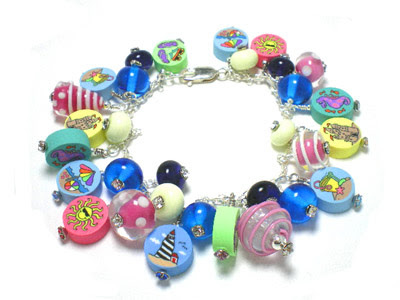 Yowee, this bracelet is packed with the colors of summer. 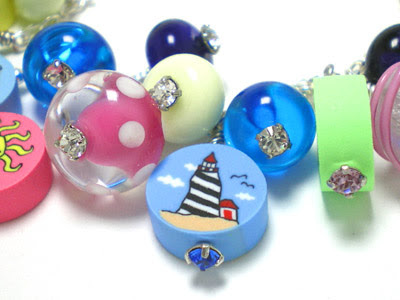 Lampwork beads in pink, white, cream & blues create a summery back drop for the spectacular polymer clay cane beads, which are NOT painted. The artist creates a design that runs all the way through a roll of clay so that each slice becomes like a mini painting on both sides...absolutely amazing. 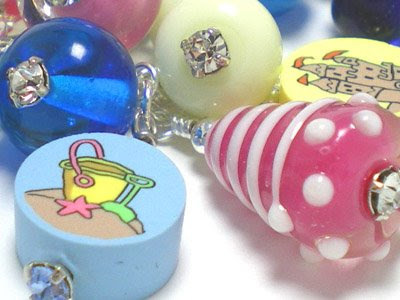 Every bead in this bracelet rests on a genuine Swarovski colored crystal to give you plenty of sparkle in the sunshine and the bracelet is very lightweight and not "jangly" sounding. 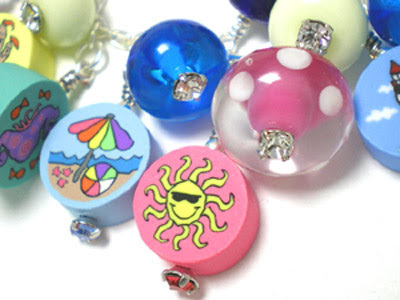 I just listed this in my ETSY shoppe in time for summer. I still have a summer special coming up here on this blog on Friday as well so be sure to pop right back for it (or perhaps 2 or 3!). Until then, enjoy the show with a few closeups.